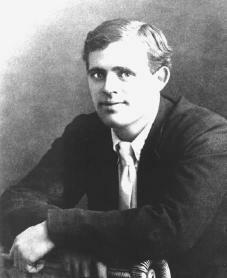 American author and supporter of socialism (a system of social organization in which the government owns and manages the distribution and production of goods) Jack London wrote popular adventure stories and social tracts (pamphlets) based on unusual personal experiences. At their best, his works are powerful and moving stories. Jack London was born John Griffith Chaney in San Francisco, California, in 1916, the son of Flora Wellman and Henry Chaney. Jack's parents were not married at the time of his birth. Flora married a widower, John London, the same year that her son was born. John was a loving stepfather, but undertook several business and agricultural enterprises that turned out to be unsuccessful. The family, which included Eliza and Ida, daughters of John London's first marriage, moved often. Because the economic circumstances of Jack's family steadily declined, he held several jobs at the early age of ten. He delivered papers, worked on an ice wagon, and set up pins in a bowling alley, all while going to school. Almost all of the money he earned was turned over to his parents. At the age of thirteen he left school and continued to do odd jobs. He managed to buy a fourteen-foot skiff (small, flat-bottomed open boat) and frequently sailed out into the Oakland, California, bay, often bringing library books with him. When Jack was fifteen, John was injured in an accident. Jack went to work in a cannery full time to support his family. The work involved bending over machines that had no safety guards. Jack worked the longest hours he could, often eighteen or twenty hours at a stretch. The pay was ten cents an hour. Jack escaped from that job by becoming an oyster bed pirate in the San Francisco Bay oyster beds. At sixteen he joined the California Fish Patrol at Benecia. Just after he turned seventeen he signed aboard a ship, the Sophia Sutherland, as an able-bodied seaman and headed to the Pacific Northwest for a seal-hunting expedition. After returning from his sea voyage, Jack worked in a jute (fiber from certain tropical plants used to make rope) mill, and then a power plant. Jack completed his high school education in a year and went to the University of California for a semester. He traveled to the Alaskan Klondike with the gold prospectors and, after returning to California, launched his writing career. life of the Alaskan Yukon, published as The Son of the Wolf (1900). Other writings in the same genre (type) followed. The best known is The Call of the Wild (1903), which describes how an Alaskan dog leaves civilization to join a wolf pack. The Sea-Wolf (1904) tells of the conversion of a civilized man to a simple way of living. These books stress the primitive survival of the fittest. This stems from London's belief in the theories of evolution that Charles Darwin (1809–1892) wrote about. (Evolution is the theory that groups of organisms may change or develop over a long period of time.) Other tales that developed similar themes are White Fang (1906), The Strength of the Strong (1911), Smoke Bellew (1912), and The Abysmal Brute (1913). London was also influenced by the socialistic theories of Karl Marx (1818–1883). An early book, The People of the Abyss (1903), described slum conditions in London, England. Other books of the same type included The War of the Classes (1905), The Iron Heel (1907), The Valley of the Moon (1913), and The Human Drift (1917). Two of London's best books are semi-autobiographical (based on his own experiences)— Martin Eden (1909) and John Barleycorn (1913). The former recounts his struggles as a writer; the latter tells about his long-lasting fight against alcoholism. London's life and work hold many contradictions. He believed in socialism, and he believed in Darwin's idea of survival of the fittest. He felt his own success illustrated the concept of the superman who stands above the ordinary person and triumphs by force of will. Although his work is often regarded as adventure stories for young people, it also deals with the adult theme of environmental determinism, or the idea that the world shapes us in ways we are powerless to resist. Bains, Rae. Jack London—A Life of Adventure. Mahwah, NJ: Troll Associates, 1992. Kershaw, Alex. Jack London: A Life. New York: St. Martin's Press, 1998. London, Jack. John Barleycorn. New York: Century, 1913. Reprint, New York: Modern Library, 2001. Sinclair, Andrew. Jack: A Biography of Jack London. New York: Harper and Row, 1977.
socialism is in it's basic definition a worker's democracy, and capital being collectively owned by the workers in some way, through the community, government, unions, or the workers of the specific company that they work for(similar to co-ops). judging by London's involvement in the socialist labor party, and his book The Iron Heel, I would guess he advocated syndication (where unions own the means of production to their respective industry) as either a Deleonist, or an anarcho-syndicalist. because of the failure on the political field to help the socialist cause in the book The Iron Heel, I would guess he had little faith in it and was likely an anarcho-syndicalist.